Do you remember the first movie you ever saw that changed your life? That was Amadeus for me, and in my previous post I talked a little bit about the night that I saw that movie with my Dad and brother in a rustic movie theatre almost 30 years ago. One of the main themes in the movie is the relationship between Mozart and his father, and how he was haunted by him after he was gone. I couldn’t help but start to see parallels between the movie and my own real life. My Dad had the soundtrack to the movie on cassette (double cassette!) and played it all the time in our house. With the exception of one piece of Hungarian music and one piece by Antonio Salieri, the entire thing was made up of bits and pieces from Mozart’s canon. A few months later, a second soundtrack was released. “EVEN MORE music from the Academy Award winning film!” boasted the paper liner. This second one was just a single cassette, but when you took them all together, you’re looking at almost 3 hours of music that seeped into my consciousness from 1985 to 1991, the year my Dad died. That’s a pretty long time to externalize this music (with regular breaks for Huey Lewis and the News, The Thompson Twins, and later, U2 of course). And even now I know these pieces and their track order with my eyes closed. There were some standouts on that soundtrack for me. The exciting first movement of Symphony No. 25 in G Minor that plays after the THROAT CUTTING SCENE, the sweetly gentle second movement of the Piano Concerto No. 20 in D Minor that closes out the film as Salieri is wheeled away to an uncertain future book end it. In between are snippets from The Marriage of Figaro, The Abduction from the Seraglio, and Don Giovanni, among other things. Almost the entire side of one cassette is dedicated to Mozart’s Requiem, and why not? Anyone who has seen Amadeus will remember the incredible death-bed scene where Mozart is frantically trying to finish the Requiem before he dies so that he can get paid for it and is dictating it to Salieri who is perched at the end of his bed like a vulture. You can’t listen to this music without seeing Tom Hulce feverishly imagining the different parts in his mind and Salieri’s struggle to comprehend the genius of it. But above all else, the one piece of music that stuck with me the most was the Kyrie from his Mass in C Minor. This piece of music is used effectively in two separate parts of the movie, so you KNOW it’s good. In real life, Mozart wrote this piece for his new bride to perform. Mozart hadn’t introduced her to his family yet, and their trip to Salzburg was going to coincide with the premiere of the Mass with Mozart’s wife as the lead soprano. Not too shabby a way to say, “Hey everybody, I want you to meet my wife!”. At least that’s how the story goes. You never really know what is truth and what passes for truth in those old stories. I can tell you that in Amadeus the Kyrie is played in the marriage scene which abruptly cuts to Mozart’s father crumpling up the letter which announces the marriage. Later on, there’s that scene where Mozart’s wife goes to Salieri with a portfolio of Mozart’s music to try to get him appointed to a court position. There’s that great scene where Salieri flips from score to score, amazed at how each one is perfect, without any corrections or mistakes. As a composer himself, he can read the notes on the page and can imagine what the pieces sound like, and the audience gets to hear snippets of each piece as he frantically flips the pages. It’s a bit of the soprano solo from the Kyrie which ultimately completely absorbs him, and he closes his eyes, totally surrendering to the music, and the whole collection of manuscripts slips out of his fingers and lands on the floor. Mozart’s wife looks up at him and says something like, “Is it not good?” and Salieri responds, “It is miraculous”. It was miraculous. All of it. The Kyrie in particular, and the Amadeus soundtracks in general were my gateway drugs into classical music. Up until that point, I don’t think I really ever paid much attention to different genres of music. There was the stuff my Dad listened to (classical and some mainstream Jazz like Dave Brubeck), there was the stuff my Mom listened to (The BeeGees, ABBA, and Neil Diamond, mostly), and then there was everything else. But I never really put much thought into what music meant to me until after I saw that movie. After watching Amadeus and being transformed by it, I developed two musical personalities. There was the outward Rock/Pop loving tastes that encompassed the stuff you’d see on Video Hits with Samantha Taylor after school each day. But then there was this other secret musical personality that I kept pretty closely hidden. This personality quietly collected and listened to classical music (and some smatterings of Jazz). None of my friends were into the type of music this second personality craved, and so I was pretty much left on my own to seek out composers and compositions on my own. My local public library was a great resource for this, as was my Dad, who I think kind of got a kick out of his elder son developing similar musical tastes as he had. Neither one of us were musical scholars or experts of any kind. He’d bring home records of composers or artists that he liked, and we would go off, just the two of us, to symphony and choral concerts. I liked having that time with him, and I think he enjoyed it too. We liked what we liked, but we couldn’t really talk intelligently about any of it. I still can’t. The furthest I would go now would be to describe myself as an amateur classical music enthusiast, and I’m okay with that. After my Dad died in 1991, I almost stopped listening to classical music altogether. That part of me went mostly dormant for a few years. Without having someone to share all this with, what was the point exactly? I can’t even tell you exactly what it was that brought me back to it, but I think it was a decade later, in my first year at law school. I found that listening to classical music while I studied helped me retain what I was reading much better than if I listened to nothing. Also, I made friends with a fellow student that year, Dan from Toronto, who was a huge classical music fan and we talked a lot about composers, artists and pieces that meant a lot to us. We attended concerts and operas throughout that year and just like riding a bicycle, I was back into it. The following year, Dan was accepted into the U of T back home, and I lost my study partner and my general interest in becoming a lawyer. I did, however, retain my love of classical music which I am happy to say has stuck to this day. All of this is heading somewhere, friend. Don’t you worry. So, a few months ago I got an email saying that this choir I sometimes sing in is doing a concert of Mozart music, and the centerpiece of the afternoon would be a performance of Mozart’s Mass in C Minor. The one that begins with the Kyrie, that piece that was responsible for igniting my love of classical music almost 30 years before. There was no way I was going to miss the opportunity to sing this piece with an 80+ voice choir, soloists and a full orchestra! Maybe somehow singing this would complete a circuit that was started all those years ago. My wife bugs me everytime I point out something coming “Full Circle”, but I yearn to find patterns and assign meaning to things that might not actually be there. “Is this another ‘Full Circle’ moment?” I can almost hear her say. We rehearsed for two months. One of the unexpected joys of singing this piece was that I was soon introduced to the rest of the Mass. In all these years, the Kyrie was the only section I had ever heard, and I knew it so well, I found I really had to stop myself from singing along with the soprano solo when we practiced. I knew every note of her part, but I had to keep telling myself “you are not a lady you are not a lady” over and over. Our conductor is from Russia, and although he is musically brilliant, he sometimes can’t think of the right word for something in English. He was trying to describe the last few bars of the Kyrie to us. He knew the word in Russian, but he was fishing for the English term. I had no idea what he was talking about, but a couple of smarties spoke up. Pretty much sums up life, huh? Other stand outs for me in the Mass included the Gloria, which earwigged me as I tried to get to sleep a couple of nights in a row before the concert, and the Credo, which had really tricky diction. Not only are you trying to get your mouth around the Latin (heyo!) but the whole choir is doing these complicated rhythms in unison so there is no room for error. I was still practicing the rhythms and words right up to about 5 minutes before we took to the stage. After the unison section, the sopranos, altos and tenors go off on these musical flights of fancy, while the basses keep everyone grounded with their foundational notes and rhythm. Finally, the Hosanna. The Hosanna is filled with so many wonderful runs, something odd happened while we were learning it. The runs were so difficult that it felt like we were never going to get them right, and then when they finally clicked at one magical rehearsal, it was almost as if those notes were always there and I found myself just closing my eyes and singing the hell out of it, feeling the music rather than reading it. It’s a difficult sensation to explain, but I think those of us who sing in choirs have felt this one time or another. But it all came back to the Kyrie for me. It was my chance to finally sing this piece and I couldn’t wait. Before we knew it, all of a sudden it was just a few days before the concert. After eight weeks of choir only, it all was sewn together in the last couple of days when the orchestra and soloists were added to the mix. I knew one of the french horn players, and on the night of the first rehearsal with the orchestra, I was telling him how much we practiced, and he told me he hadn’t even looked at the music yet! I guess that’s the difference between an amateur and a professional musician. The concert itself went wonderfully well, and I got a real sense that our director was pleased with how it all went too. It was an honour to finally get to sing this piece of music, especially the Kyrie. You’ll be happy to know that I kept it all inside for the soprano soloist’s parts too.. At the end of the concert I was filled with such a sense of good will and well-being. Every soprano and alto was my sister, every tenor and bass my brother. I had sung with his choir many times in the past, and I had never felt this feeling of kindredness before. There were actual high-fives, handshakes and even the odd hug. I think my Dad would have been so proud of what we accomplished that afternoon. I came up into the sanctuary after the concert was over to collect my wife, mom and mother-in-law who braved the cold to come hear it. I wanted to get their take on how it sounded, because I knew they would be honest. “How was the balance with the orchestra? Could you make out the words? Did the sound get lost at all?” These were the burning questions I needed answered. My wife? “My favourite part was the Russian piece you sang in the first half. Sure, the Mozart was fine too, but I’d love to hear that Russian one again.” Go figure. My Mom? “Well that Bass soloist didn’t have very much to do, did he? Does he get paid the same as the other soloists?” I told her I didn’t know, but I’m PRETTY SURE soloists aren’t paid per sung note, but you never know. My Mother in Law? “Did you see me waving when you walked in?” I did. Maybe after all this time this too was just a deceptive resolution. Our local symphony orchestra had their final concert of the season the other night. It was Mahler’s second symphony, commonly known as the Resurrection Symphony. Clocking in at about an hour and a half, you get a full concert experience. It was the most popular of Mahler’s works to be played in his lifetime, but then something happened at the beginning of the 20th century. The world turned on Mahler and symphony orchestras around the world stopped playing him. It wasn’t until the 1960’s when Leonard Bernstein, conductor of the New York Philharmonic, began to reintroduce audiences to his favourite composer. He was met by bureaucratic red tape and some outright hostility from the public at the outset, but through his efforts Mahler slowly returned to the consciousness of the symphony orchestra attending public and remains a fixture on the programs across North America and around the world. Mahler, to me, remains a mystery. By the time I was a teen, I was indoctrinated as a classical music fan. Growing up, my Dad listened to classical music almost exclusively. He had one or two jazz albums (Time Out by the Dave Brubeck Quartet comes to mind), but the bulk of his collection leaned heavily towards symphonic works. This was balanced by my Mom’s collection of BeeGees, ABBA, and her beloved Neil Diamond. But as far as I can remember, there was no Mahler in my Dad’s record collection. He seemed to favour Mozart and Handel above all else, with a nod to Beethoven here or there. Oddly enough, he had a passion for organ music. I remember on summer road trips the rule was we could each choose one side of a cassette to listen to in the car. My brother and I would be picking stuff like Glass Tiger, Dire Straits and Huey Lewis, my Mom: Neil Diamond of course, and my dear old Dad would always pop in some “Great Organ Masterpieces” or some damn thing. Well that usually killed the vibe, and the dramatic change in volume between the quiet, gentle moments and the loud bits when all the stops were pulled out nearly caused my Mom to drive off the road a few times. (My Mom always drove on holidays, my Dad “navigated”: a reversal of the typical stereotype). But Mahler never made it on the road. Mahler to me seems like a code: Nine full symphonies. One uncompleted one. Some are short and sweet (like Number 4), some are devastating (like Number 6), one is entirely performed with a choir (Number 8). The music is sometimes harsh and unmelodic, and yet other times can be the most transcendental thing you’ve ever heard. Like a storm and the quiet after the storm. Maybe you wouldn’t have appreciated the quiet so much if you didn’t have to endure the storm. Something in me felt a long time ago that if I could learn and listen and recognize the difference symphonies, then maybe I would unlock something; some secret musical mystery that has been lying dormant for over a hundred years. An auditory Da Vinci code, if you will. I know it sounds crazy, but that was my motivation a few years ago to learn a little bit more about Mahler and his music. With Mozart, what’s to get? It’s beautifully melodic music from the first time you listen to it: almost instantly recognizable, and at the same time new and fresh. Whenever I hear a new Mozart piece to me, I marvel at its beauty and also feel perplexed at the possibility of it ever not existing. At the same time, it’s perceived simplicity can also make it unfairly disposable. Mahler is different to me. Mahler feels more like homework. Neither my wife nor I were particularly enthused about going to hear Mahler 2, for a couple of different reasons. I had bought the tickets back in the winter because there was a chance I was going to sing in the chorus that sings in the final movement. I periodically join a local choir in town, especially when they perform larger works with the local symphony orchestra. I thought that if I was singing in it, then maybe my wife and a friend would like to come and see it, or maybe my Mom. I wanted to get the tickets ahead of time because sometimes these big “event” concerts sell out. Well, as it turned out, this past Spring proved to be extra busy and I couldn’t commit to the rehearsals. Ironically, I wouldn’t have minded singing in it, but sitting through it was another idea altogether. I’ve tried listening to Mahler 2. I have it on my iPod. (The Leonard Bernstein version, of course), and I just can never seem to get into it. Mind you, listening to it on a little set of stereo speakers or through ear phones while you’re making supper or reading a book is not how it was intended to be heard. Another factor was that a friend of ours was having a reading of her new play on the very same night. A bunch of our friends were going to be going to that and there would be a chance to go out for a visit and a drink and a bite to eat afterwards and it was going to be fun and great and oh right. We can’t go. We’ve got Mahler. But despite these reservations, we decided to go anyway. We were both pretty glad we did. After a brief bit of comedy involving our seats (someone was sitting in ours, but when she got up to move she insinuated that she wouldn’t mind sitting in my lap! 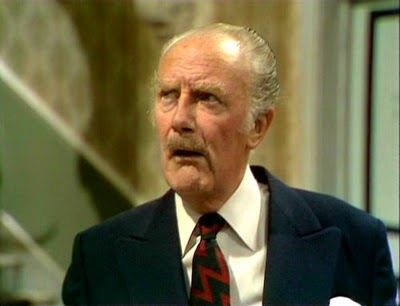 My wife was seated next to this guy who was a dead ringer for the Major from Fawlty Towers who seemed pleased he didn’t have to sit next to lap girl. That honour went to me), we settled in for the performance. The Major, our seat mate. Mahler’s Second was the only piece on the program that night and there would be no intermission. An hour and a half of nonstop music. From the opening tremolo in the upper strings being answered by the lower strings, I began to realize that Mahler was not designed for iPods or earbuds. I tend to treat classical music as “background” music: something nice to listen to when you’re doing the dishes or reading or driving. Mahler, on the other hand, demands your full attention. Watching the interplay between the different parts of the orchestra, and then later the interplay between the soloists, chorus and orchestra, I was struck at how revolutionary this must have sounded when it premiered over a hundred years ago. The program notes, written by Mahler himself, explains that his second symphony is an interpretation of the journey from death to life. In typical Mahlerian fashion, he later banned any program notes from subsequent performances, encouraging the listener to come to the mystery their own way. Throughout the performance, I began to think about the Mahlerian code again and wondered if maybe the code is that there is actually no code, that the music ultimately speaks for itself and will mean something different to each listener. Isn’t that a hallmark of true art anyway? It would let me off the hook, but questions linger. What I do know is that I don’t want to listen to Mahler on my iPod anymore. In fact I think that I said that to my wife afterwards. “Why would anyone want to listen to that on an iPod after hearing it live?” The Fawlty Towers Major leapt to his feet for an immediate ovation, and the lap girl happily stayed in her seat until the end. I couldn’t begin to guess what their stories were. I can’t imagine anywhere else where the four of us would belong. Amazingly, my wife’s ears cleared enough for her to really get something out of the evening. So much so that she even heard the cougher and the crumpler behind us. Mahler, too, remains a mystery, and I’m okay with that.